CJT Families - we thank you for your continued support of the Brock Strong campaign. Here is an update as of 10/7/2015. Nearly $6800 raised through the GiveForward campaign. Another $5200 raised through Brock Strong T-shirt Sales, and kickoff picnic 50:50 raffle donations (special thanks to Paul Sorenson who donated his 50:50 winnings back!). Like most eight-year-old boys, Brock Iverson is an energetic, active, fun-loving kid who loves sports, being with friends, and giving into the periodic video game requests - as long as they are sports related. From the minute Brock wakes up until the moment he falls asleep, he is rallying his friends and neighbors to play…a true leader, even at the tender age of 8. Before we share more of Brock’s story with you, it is worth mentioning that Lynne first moved to Cary in 1999 because she was drawn to the sense of community in Cary. Once married, she and Bart remained here to raise their children. Since their first child, Brooke (now 11) was old enough, the Iversons have been active in Cary Junior Trojans, Cary-Grove Youth Baseball & Softball, and a number of other community activities and charitable causes. While there are many great stories in between, the story we wanted to share with you begins 6 years ago. The Iversons were your “typical” Cary family - Dad (Bart), Mom (Lynne), Brooke (5) and Brock (2), 6 fish, and 2 dogs. Bart was coaching Brock in t-ball, taking Brooke to the pool, and getting in some golf at Foxford Hills whenever possible. All was as it should be until that summer when the Iversons learned that Bart was diagnosed with advanced stage colon cancer. Like so many American families, the terrible news of Cancer potentially changing their family dynamics hit everyone hard. After a brave and courageous fight, Bart lost his battle with Cancer at the young age of 42…about eighteen months after his diagnosis. Crushed by the loss, Lynne knew only one way to respond - positively. Doing everything she could to keep life “normal”, Lynne turned to local sports organizations like CJT to keep Brock and Brooke busy and active doing what they loved most. Over time, the Iversons began to heal, believing the dark days of Cancer were behind them and their family. Last November, Brock came down with a sore throat and congestion which the pediatrician soon diagnosed and tested positive for strep throat. Even after a round of antibiotics, Brock’s congestion worsened throughout the holidays and again he tested positive for strep throat. Concerned about her son’s worsening condition, Lynne turned to an ENT where Brock had a CT scan revealing a lot of swollen tissue. The game plan was to do a biopsy and potentially remove Brock’s adenoids. The Saturday before the scheduled surgery, Brock woke up with purple dots all over his legs and torso. His doctor quickly recognized it as petechiae and she immediately ordered blood work. On Saturday, February 7, following his blood work, Brock and Lynne went home that afternoon to snowmobile and snowboard. On Lynne’s mind was doing anything to keep her and Brock’s minds off of his condition and several months of non-stop congestion and discomfort. No more than a couple hours after the blood work was drawn, Lynne received a call from Brock’s doctor that she could have never imagined. The Iversons quickly learned that Brock was diagnosed with t-cell Acute lymphocytic leukemia (ALL) and needed to meet with the oncologist at Ann & Robert H. Lurie Children’s hospital immediately. 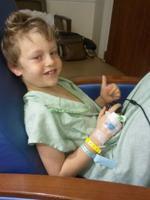 No more than two days later, Brock had a bone marrow aspirate and was officially diagnosed. Brock started chemo the very next day and yet another chapter had begun for the Iversons…less than 5 years after Brock, Brooke and Lynne lost their father and husband to Cancer. It’s worth noting that Brock & his father’s Cancer are completely unrelated (not genetic), just a bad coincidence that it hit the same family. It’s been just over six months since Brock was diagnosed and like every other obstacle he has encountered, he has been incredibly brave and tolerant of his treatments. If you didn’t know he was dealing with this, you would think he is just an average eight-year-old boy, yet another characteristic that makes Brock Iverson something special. Within this time, Brock has had 2 bone marrow aspirates, 9 spinal taps with chemo injected into his spinal fluid, a PICC line in his arm, a port put into his chest (to administer the chemo directly into an artery), 6 blood transfusions, lost & re-grew his hair, 23 nights of in-patient chemo, and has taken just over 200 doses of chemo and steroids. But who’s counting? Not Brock. Despite Brock’s road to recovery and treatment mapped out over the next 3 years, Brock remains committed to being a “normal” kid. He just finished a season of baseball where Brock played outfield and had several clutch hits for his team - despite going through treatments just days earlier. Brock’s sister Brooke has been his #1 cheerleader (maybe tied with mom) and has remained supportive despite having to take the back seat to her brothers treatment needs. She too faces each day with a smile as she stays with friends and family when Lynne tends to Brock’s care and treatment. As mom, Lynne continues to be a rock and foundation for Brock and Brooke, balancing work with taking the kids to and from their school, football and baseball practices and events along with many other activities that normal eight-year-olds are doing. Except one thing. Brock isn’t normal. Brock always has a smile on his face, regardless of the Cancer and treatment that are beating him down every day and night. Brock will be the first to give his coaches a big hug, regardless of wishing his dad could be his coach. Brock is strong - BROCK STRONG! We are asking the friends and family of Cary Junior Trojans program and the entire Cary community to join us in our support of the BROCK STRONG campaign in an effort to raise funds to help make life a little more “normal” for Brock and his family during these incredibly challenging emotional and financial times for the Iversons. As a result, we are asking for you to purchase a Brock Strong shirt (will be for sale at CJT events including the kickoff picnic). Consider contributing financially to the BROCK STRONG campaign as we continue to show Brock and the Iversons how our community is also BROCK STRONG!